This revolutionary Protect-A-Bed® system is designed to waterproof and keep your child's mattress free of stains while reducing the amount of clean up time and embarrassment associated with bed wetting. In addition the Potty Kit provides a barrier between your child and the mattress from irritants such as dust mites and other bacteria that can cause allergies, asthma and rhinitis. You'll protect your child's health and well being while you protect the life of the mattress. Simply layer the contents of the Potty Training Protection Kit with the bedding that you normally use at home in the order depicted above. 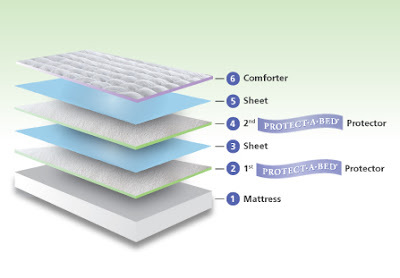 When an accident occurs, strip the top sheet and 1st Protector, revealing the clean bedding below. Your Child can get back to sleep almost immediately, and your night-time clean up is no longer a nightmare! 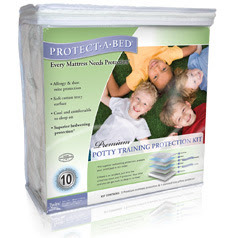 Although I have come across many varieties of mattress protectors meant to help shield a child's mattress from possible bed wetting while potty training, I've never seen a system quite like the Potty Training Kit by Protect-A-Bed. With two mattress protectors (that offer a fair amount of padding while serving as a protector) and a pillow protector, this system allows for the best line of defense while potty training your little ones. As pictured above, you simply layer the bedding one protector, one sheet, and an additional protector and additional sheet. So, when little ones do have an accident, you can easily take off the affected sheet and protector and you immediately have another clean dry sheet and protector underneath ready for your child (and you) to get back to sleep as fast as possible. This quick and effective method also helps to alleviate some of the embarrassment by making the process more speedy and less of a production (especially in the middle of the night). Thoughtful design, and impeccable quality! A definite must-have tool for potty training! Leave a comment~Visit http://www.protectabed.com/ and let me know another product that you would love to have. The comment is considered your entry. I would love to have Protect-a-bed's Bed Bug protection kit as a preventative measure. we already have their waterproof twin mattress cover for my son and love it. We are in the potty training process for my daughter so this giveaway is perfect for us! I would love to have their premium queen size bed mattress pad/protector along with 2 of their pillow protectors for our bed. Definitely the bed bug protection kit nowadays! I would love a premium mattress protector. I am allergic to dust mites and I'd love something to help with that. I entered the Tablet giveaway. I like Protect-a-bed on FB - Cari S.